This deliciously creamy cheese, pronounced boor-RAH-tah, is a specialty of Southern Italy, especially the regions of Puglia, Campania, and Basilicata. Burrata was invented in Andria at the beginning of the 20th century. Traditionally made from buffalo's milk, today most burrata is made from cow's milk. Classified as a "spun" or "pulled curd" cheese, burrata's uniqueness lies in the buttery texture of the cheese's center: "Burro" means butter in Italian. 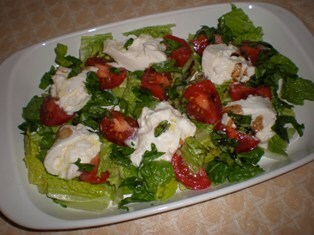 shedded mozzarella with a touch of acidity, and the more complex and cheesy outer layer. burrata wrapped in the protective leaves of asfodelo, which is an herb-like plant similar to leeks. The leaves will indicate the freshness of the cheese; as long as the outer wrapping stays green the cheese within is still fresh. Burrata has become popular in recent years and it can be found in many cheese shops and even local supermarkets. Most commonly it is sold in plastic containers surrounded by whey or water. Traditionally, burrata is cut in half and served in a deep plate. Serve burrata paired with fresh tomatoes, fragrant basil, and a drizzle of extra virgin olive oil. 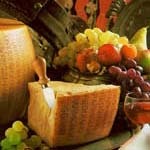 Its marvelous liquid center can be scooped up with slices of crusty bread and accompanied by a bottle of wine. Try tossing burrata in pasta or serving on a fresh green salad. In a mini food processor, mix olives, oil, vinegar, and garlic. Spread bread with olive mixture. Toast on baking sheet for 10 minutes. 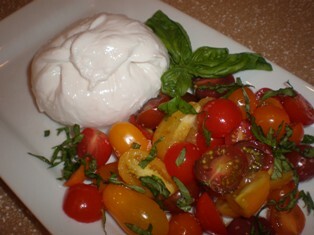 Top with burrata and garnish with basil Season wtih salt and pepper. CAN'T FIND BURRATA CHEESE IN YOUR NEIGHBORHOOD? Claudia Lucero shows step by step―with every step photographed―exactly how to make sixteen fresh cheeses at home, using easily available ingredients and tools, in an hour or less. The approach is basic and based on thousands of years of cheesemaking wisdom.